"Don't worry I know what I am doing, I saw it on Pinterest"
My darling hubby was all for saving up and tearing the old one out and replacing it. I on the other hand did my research and was confident that I could turn this old baby around and make a great kitchen for myself! Here she is in all her old glory. Very dark and enclosed! We added in the Island from Ikea when we first moved in to extend our work area and add an area for quick breakfasts and homework projects after school. The countertop was a nasty off white colour and had large chunks missing from it in places too. The Island helped inspire how I planned to paint the cupboards going for a black on the bottom with butcher block tops. I wanted to make the kitchen feel bigger so opted for a light grey for the top cupboards. There is a lot of work to do when painting your kitchen cabinets and most of that is the preparation work done before you even get your paintbrushes out! Taking out the built in extractor hood and removing the cupboards to the side opened up the space so much. The top cupboards were de-greased, sanded, primed with 2 coats and then painted with 2 coats of melamine paint. The bottom cupboards were de-greased, sanded and then finished with 4 coats of black wood stain. The bars and baskets were from Ikea as was the butcher block countertop. 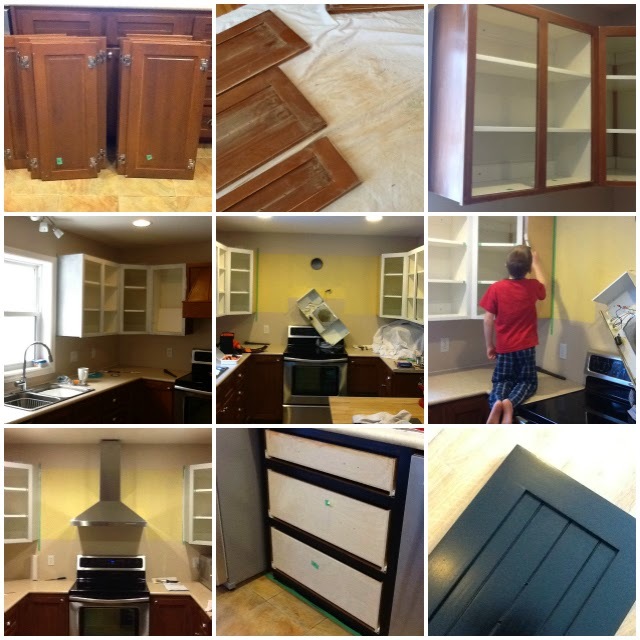 I had never intended this to be a post about how to refinish your own kitchen as being honest I just read lots of other peoples posts and watched lots of instructional videos on the subject so I am no expert! I will say that it has certainly been a labour of love and as careful as I was in preperation and application you can still see the odd brush stroke and bubble, but we love the extra charm that brings. This is a modern kitchen in a country house and we feel that this look perfectly captures that. I am now off to bake something tasty in my new space! It's gorgeous Elyse - you did a fantastic job!!! your kitchen looks great!! Amazing how a lick of paint and a bit of rearranging can make the space totally change! Also! How sad is it to wake up to this day today in Edmonton! My seedlings are very upset! I read your article.Your Kitchen looks Osum!! !You have done great Job.This information are very helpful to design the Kitchen.I like Your view and I agree with you.Your lick of paint are very nice.it looks great.Thank You for sharing the informative post. What matters is that you've got the tools and the basic geographic template for an appealing kitchen. I'll be looking foward to when that whole project materializes in full, with the sinks that are not only working, but are doing a better job this time. All the best! Traditional kitchens still dominate most of the work we do at Kitchen Designs. White traditional kitchens represent almost 50 percent of all kitchen sales. The renovation was a success! Your kitchen is way better than before. You chose the right color combination for this room. Congratulations for this project. Hi I really appreciate all the great content you have here to read about stamped concrete this topic I am glad I cam across it!